There are a number of new tax initiatives unfolding across the Gulf Cooperation Council, the most publicized and cohesive of which is the value-added tax to be introduced collectively in 2018. There are a number of new tax initiatives unfolding across the Gulf Cooperation Council, the most publicized and cohesive of which is the value-added tax to be introduced collectively in 2018. There are also individual country initiatives that aim to increase government revenue through taxes, but also to better institutionalize and streamline private sector regulation. These initiatives include increasing corporate tax and, in the case of Oman, implementing new taxes on smaller businesses and rules on registering existing businesses. There are also changes underway on border tax regimes, including raising tariffs on imported goods. As a burgeoning global trend, especially evident in the economic ideology of the administration of U.S. President Donald J. Trump, economic nationalism is also surging in the Gulf. Each GCC state is competing with its neighbors to create a more attractive business environment for foreign investment and squeeze as much revenue as possible from new and existing fee and tax structures. A casualty of these tax reforms could be a weakening of GCC economic integration, especially on agreed upon common tariffs. The GCC secretariat, meanwhile, is interested in ways to streamline the bedrock of foreign investment rules in the region, the agent structure, which each GCC state uses to regulate how foreign businesses must partner with local citizens or entities to create domestic businesses such as retail and restaurant franchises and distributors of consumer products. One complication of the agent structure is the disincentive for intra-GCC trade, as each state seeks to award a franchise or distributor role to its citizens. Finding common ground on tax and tariff policies that directly impact job creation, citizen income, and state revenue is becoming more complex. In effect, while the great economic reform momentum sweeping across the GCC is necessary for shared diversification goals, it also pits states against each other in putting their domestic economic agenda before integration efforts. The GCC Unified Customs Law is designed to assess equal duties or tax on items entering any member state, and then eliminate any further tax if a good is exported from its first GCC entry point to a second member state. The general rule is a 5 percent tariff rate, though each GCC state has been able to exclude goods from the rule. The GCC Free Trade Agreement allows duty free transfer of goods produced inside the GCC (as long as the factory is at least 50 percent owned by a GCC national or entity). The Unified Customs Law came into effect in January 2003, and there have been some benefits for intraregional trade, with a four-fold increase to $100 billion by 2014. The GCC common market, in which citizens (and services) have free movement to travel without visas or tax, came into effect in January 2008. Oil exports continue to dominate GCC trade patterns, dwarfing intraregional trade at $1.6 trillion in 2014, at the height of the last oil price boom. For Gulf governments, after the hard won negotiations over the customs law and common market over the last decade, there is again temptation to increase tariffs on imports, as a means of revenue generation and to encourage domestic production. Saudi Arabia has struggled with this aspect of GCC economic integration, with import tariffs of as much as 20 percent in place as late as 2012 on hundreds of items, including matches, plastic bags, textiles, and tents, all designed to protect local manufacturing. Those tariffs were lowered as part of a series of GCC negotiations, but as of January 1, many are back in effect. Some of the new tariff increases are part of expiring government subsidy programs, in which the government subsidized its own import duties, in effect charging the importer but then “covering” the extra cost to consumers on a number of food and beverage products, chemicals, and consumer products. Now, consumers (citizens and foreign residents) will see and pay these costs. Perhaps more importantly, Saudi Arabia is more directly contradicting the GCC Unified Customs Law in its efforts to reduce government spending. National debt should not exceed 60 percent of a given state’s gross domestic product. The national budget deficit should not exceed 3 percent of a state’s GDP. National inflation should not exceed 1.5 percent of the average inflation of all member states combined. Long-term interest rates should not exceed 2 percent of the average interest rates of all the GCC member states combined. 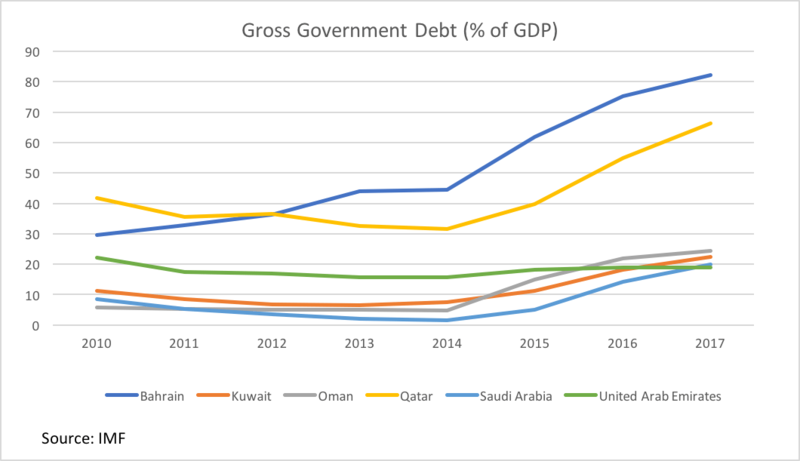 The current economic reform agenda, and fiscal crisis affecting the GCC states, will not permit states to meet these shared goals, which a few years ago seemed reasonable as debt to GDP levels were very low and inflation not a very real concern. Now debt issuance is the method of choice for financing deficits and continued government spending. The impact of this debt cycle will vary across the GCC, as some states will be better positioned than others to service the debt and find alternative means of revenue streams through diversification efforts that stimulate private sector growth, sell-offs of state assets, and a willingness to tax. How domestic economies respond, especially to rising costs of utilities, consumer products, and even construction and manufacturing materials, will create different levels and kinds of inflation, or rises in cost of living. Inflation has also varied considerably between 2014 and 2016, as countries have adjusted to changes in government revenue and spending patterns. For citizens and smaller businesses, there are some important changes underway across the Gulf. There is some misperception that the so-called rentier states of the Gulf are tax free. They are not; and in the current fiscal environment they are on a course (with the full support of the International Monetary Fund) to implement tax and business regulation that will affect every worker and employer. Corporate taxes across the GCC are heavy on oil and gas companies. New corporate taxes in Oman at 15 percent for large (non-oil) businesses are in line with existing tax rates in Qatar and Kuwait. New municipal taxes on rental properties in Abu Dhabi are evidence of the preference to tax noncitizens first. There are also some potential challenges in the shared collection of tax and dispersal of tax revenue within the United Arab Emirate’s federal structure. The Omani rules to also register small businesses with a tax identification card indicate an improved effort at regulation, which could make additional tax collection easier down the road should the relatively low rate of 3 percent increase. The prioritization of fiscal policy that can generate new sources of revenue is understandable and commendable for the breadth of changes moving forward across the GCC. What may be lost is the decade of efforts in economic integration and negotiations to make the GCC work as a common market, with complementary assets. The tradition of competition among the Gulf states in their free zones, as well as port and airline hubs, speak to shared diversification strategies. Strategies of cost saving now are equally competitive and similar in nature, but they may also create missed opportunities in intraregional trade. For most of the GCC states, and most notably Saudi Arabia, the economic reform and diversification agenda takes precedence over regional integration. Meaningful regional integration could be on hold until domestic economies are on a more stable non-oil growth trajectory. 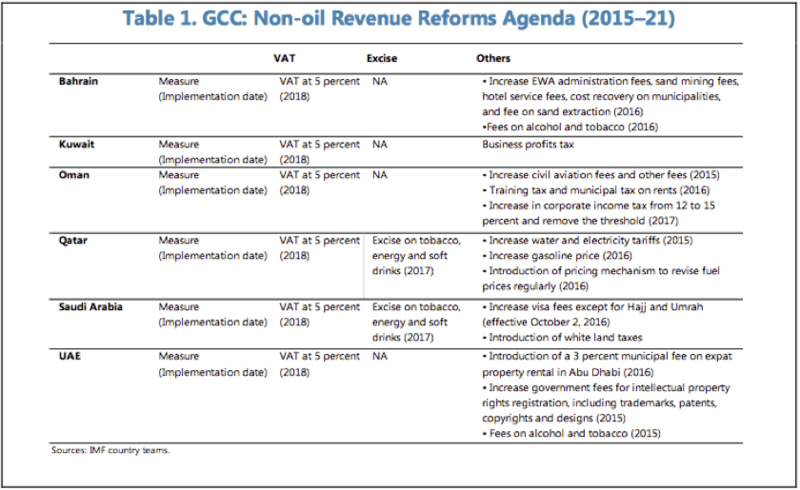 Of all of the possible economic reforms to help Gulf states meet the demands of current fiscal spending amidst the decline in revenues from oil exports, a coherent and shared GCC tax regime is not one of them.